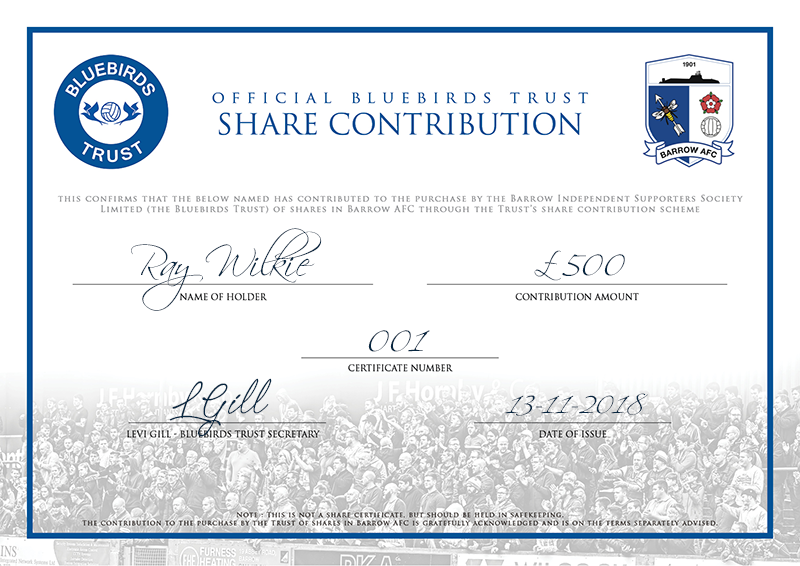 The Bluebirds Trust has been offered an exciting opportunity to bring 10% of Barrow AFC back into the hands of the community, but in order to do that we’re going to need the support and contributions of everybody who loves our town and our Club. Navigate this page to find out more about the offer, how the Trust intends to raise the money we need and what benefits you could gain by becoming one of our contributors. 1. What exactly is happening? Interim Barrow AFC Chairman Paul Hornby is putting together a consortium to buy the Club from Paul Casson. He believes that the fans should own a stake in their Club, so he’s made the Trust aware of an opportunity to buy 10% of the shares if we want it. 2. Why have the Trust decided to invest? We felt that this was the right time for the fans to own a stake in Barrow AFC again. The information that we’ve been given suggests that this is a good deal at a fair price, and we believe that this is the best way to ensure the voice of the fans is heard as the Club moves forward. 3. What exactly is the deal? 10% of the Club’s shares for £50,000. This is the same value that all other investors have been asked to pay for their own shares. 4. Will we be getting the same voting rights on the Board as other investors? Absolutely. Our shares will give us a voice when it comes to appointing the new board and setting the future direction of the Club. Additionally, the Club has agreed that one board member will always be nominated solely by the Trust. And best of all, certain key issues such as selling the ground will require fans’ consent to proceed. 5. How will the Trust raise the money? The Trust has committed a minimum of £10,000 from its own funds, but we can’t cover the whole cost of the shares that we’ve been offered. The only way this works is by the support and the wider community getting behind us. 6. Does that mean that individual fans will buy and own shares? No. The Club and the Trust have agreed that the shares we buy will be held through the Trust. This is a recognised model in cases like ours. Apart from making the administration easier, it also ensures that the supporters’ voice within the Club is clearer and stronger as a single, unified block rather than being dozens or hundreds of small holdings. We also advise supporters not to think of this as an “investment” to generate a “return”. But with that said, measures are being put in place so that if we decide to sell our shares in the future, all proceeds come back to you, the contributors, including any profit. This goes for any dividends we receive too. 7. Do the contributors get any recognition or benefits? Of course. Anyone generously donating £10 or more will get a commemorative certificate noting their contribution amount, with a unique certificate number. Apart from being nice keepsakes we feel these could be great Christmas gifts. But that’s only the start. In collaboration with the Club we’ve negotiated a tiered contribution system where giving various sums could get you a lifetime Trust membership, discounts in the Club shop or corporate hospitality, or even 10% off next year’s season ticket. See our website or ask in the Trust shop for more details on these tiers and the pricing. 8. What if the contribution is made on behalf of a child? We hope that lots will be! Anybody under 16 will have to proxy their voting rights at the Trust AGM to a parent or guardian, but apart from that things should work much the same. We’re more than happy to take, for example, a £30 contribution and split it into 3x £10 certificates for children. 9. Okay I'm sold. How can I contribute? Contributions to shares can be made in the Trust shop, the Club shop or online on the Trust website. If you buy in-store, you can take your certificate away the same day. You’ll also see buckets appear around the ground and bar and we’d be very grateful for any loose change you want to give. If you want to do more, we have lots of options. First of all, have you joined the Trust? If not, ask for a form at your next home game or sign up online on our website. The Trust will also be organising various fundraising events in the coming months. Please support these where you can. Hopefully they’re a fun way for the support to get together socially and raise some money at the same time. And of course please keep giving us your support in all the usual ways, whether you take part in our match-day raffle and football cards, join the lottery (where you could win £25,000 both for you and the Trust) or visit the Trust shop for refreshments. Everything helps! 10. Do I need to be a Trust member to contribute? No, anybody can contribute. But it would be great to see as many of you join the Trust as possible. By joining the Trust you get a say in how the shares that you contribute toward are used. You get a vote to select the Trust’s board and our representative on the Club board too. 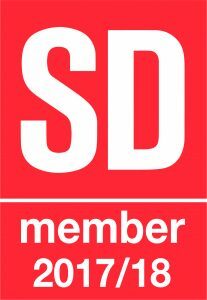 Also, we’ve made sure that certain contribution amounts earn half price, free or even lifetime Trust memberships, which hopefully shows our commitment to making sure that as many of those who give money as possible become a part of the voice that we collective share within the Club. 11. Anything else I need to know? Only how excited we all are to take on this challenge as a supporter community. This isn’t about fans giving money to the Trust and then forgetting about it. This is a key opportunity to increase Trust membership, get more fans engaged in electing our Trust Board and our representative on the Club Board, or maybe even stand for election yourself! This community is at its best when we work together so buy yourself and your kids a contributor certificate for Christmas, come along to our race night and other events we have coming up, and if you have even more time to give then please get in touch. We’re going to have a very busy few months and any help is greatly appreciated. 12. Where can I find out more? Our social media links are provided below, as well as the Trust’s email address. Keep in touch through all of these, but don’t be afraid to come and see us in the Trust shop or stop us in the ground. As we progress, the Trust will be giving regular updates on how we’re doing at raising our target. 13. Are my money and data safe? Absolutely. Any money you contribute will be held in a dedicated account and ring-fenced from all day-to-day Trust activities. Our bank accounts are controlled solely by responsible individuals nominated by the board. Any data we collect from you will be securely stored and retained in compliance with GDPR. Contributions made online using card details will be encrypted, and handled on a secure SSL network in accordance with The Payment Card Industry Data Security Standard (PCI DSS). LIFETIME free hot drinks in the trust shop for yourself.